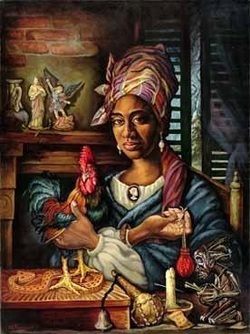 A major difference between Hoodoo and Voodoo is that those who practiced Hoodoo did not spend a lot of time depicting their ceremonies, rituals and practices. Instead, those who practiced Hoodoo would spend their time creating specific symbols for each individual person who was to be involved in the rituals. The true art work are the remains from their practices which are rarely found. 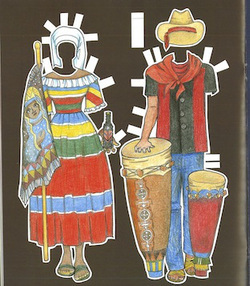 This is due to the individual holding onto their pieces as this was the depicted path of their adventure through life. The precursor to today's "Voodoo Doll." This statue is called a Bochio Figure and these were usually to guide one in their life journey and give well wishes. These dolls were most commonly used to represent love, life and riches; only under rare circumstances were they used with a curse to promote bad or evil. Hoodoo art is usually representative of the ceremonies they had. These ceremonies consisted of music, dancing and performing magic rituals to heal those who were involved and promote good fortune. 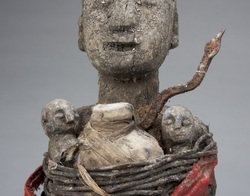 A piece of art work illustrating the duties of a woman healer. She was in charge of preparing meals for her family while also using various elements found within nature to perform rituals. The statue in the lower right corner of the picture is the commonly seen Bochio Doll. Additionally, this picture shows her candles used in ceremonies or magic, her Mojo bag hanging from her hand which provided good fortune and security and her various religious figures in the back ground. 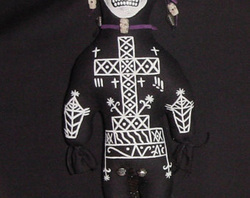 A commonly seen aspect of art in the Hoodoo culture is the Bochio Doll with painting over the body. These paintings represented the various herbal remedies used to cure and strengthen those within the culture. Each symbol is representative of a specific root, herb or piece of animal that would guide the individual in a healthy and prosperous life.